We are pleased to publish the details of Services for the whole St. Arvans Group for April. This includes the end of Lent, Holy Week and Easter. We hope to see you over the Easter period at this, the most important time in the Church’s year. All are very welcome. Please click on the link below for the Parish Newsletter for the coming week, commencing 7th April. We are pleased to add a list of our Services for the Fiveways Group of Parishes for March 2019. If you just fancy some Music, why not attend the Carols around the Christmas Tree in the St. Arvans Churchyard (in Church if weather dictates) with the Chepstow Town Band. 6pm Friday 21st December. 7pm Friday 28th December, St. Arvans Church – Dave Ayre’s Christmas Baroque Night. See separate Post for further details. Please click on the Link below for all the details of Services for Christmas and the New Year. We wish you all a Happy and Peaceful Christmas and hope to Welcome you at one or more service. 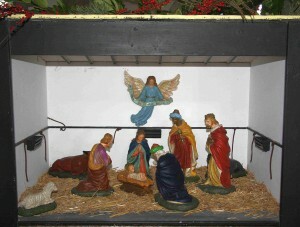 Please click on the Link below for the Advent and Christmas Message from Fr. Michael. This coming weekend there are a number of Events in St. Arvans to commemorate the 100th Anniversary of the end of hostilities in WWI. On Sunday the 10.00am Service at St. Arvans will be followed by an Act of Rembrance at 11 am in St. Arvans Church.